The new Olympus Stylus Tough 8010 is still the perfect camera for the adventurous person. Featuring a 14-Megapixel imaging sensor, 5x optical zoom lens and 720p HD video capture, it has all of the features of a top digicam with but with the versatility to let you live your life. Read more in our Full Conclusion. Heading up the 2010 line of Lifeproof cameras from Olympus, the Stylus Tough 8010 retains the same "tough" features as its predecessor, the Tough 8000. This new camera is still Waterproof in depths of up to 33ft., Freezeproof down to 14°F, Shockproof from drops of up to 6.6ft., and Crushproof up to 220lbs. Tap control has also been carried over, allowing for easy camera control when pressing the small buttons is not convenient. For the 8010, Olympus has upgraded to a 14-Megapixel imaging sensor, 5x optical zoom lens, 2GB internal memory and added a One-Touch video recording button as well as 4 new creative art filters for more versatility. 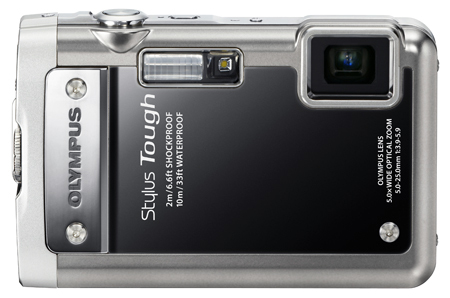 The Olympus Stylus Tough 8010 is available now with a MSRP of US $399.99.